to Scoresby Sund, Northeast Greenland. Apply for your place on the adventure of a lifetime! Since November, when we wrapped up the Melrakki Arctic Fox Photography workshop in the Westfjords, myself and Icelandic Explorer have been working hard, devising an even greater adventure. Now, we are pleased to announce Silent Arctic, our newest, boldest and most adventurous workshop yet! 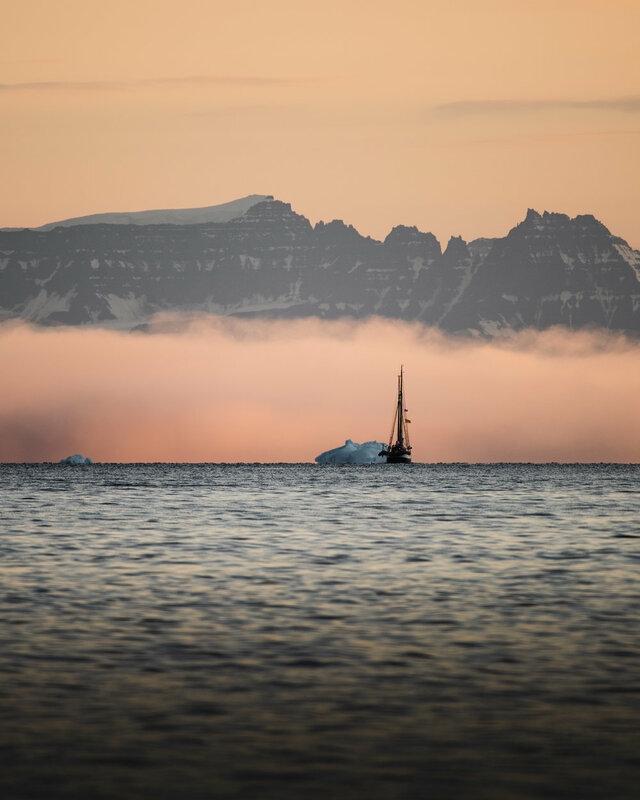 This is nothing short of a full-scale expedition in Northeast Greenland via electric schooner along and into the world's largest fjord system, some of which are nearly 150 miles in length. Here, the photography opportunities are endless as we lose ourselves in this epic world of ice and immense scales: a landscape whose wonder reaches far beyond the limits of our imaginations. APPLY NOW AND JOIN MYSELF AND ICELANDIC EXPLORER ON THE ADVENTURE OF A LIFETIME! An epic group dynamic, all-inclusive. Having so many new things with so many new people creates very powerful bonds between everyone involved, fomenting and powerful and lasting friendships. Below, previous workshop participants reflect on the experiences that the workshop left on them. — Mia Nguyen, Melrakki Arctic Fox Workshop in Iceland's Westfjords, Nov. 2017. Silent Arctic was beautifully organized - the gorgeous schooner, the crew, the itinerary and most of all an amazing collection of like-minded individuals in the workshop! This experience with Gunnar & Joe took us deep within... the high arctic, the fjords, and yes - self-reflection. In a way, everything slows down for a week, and yet there is so much to absorb - valuable insights from the guys, the other participants, and the jaw-dropping beauty of the nature around you! With no distractions of everyday life, your focus is heightened and you can really think about how you want to grow your photography skills. Oh and chilling in the hot tub on deck isn’t bad either. They said there is life before Greenland and life after. They were right. I’m definitely going back! Gunnar and I will be providing a very small group experience, limited to just 10 participants. This means that we will be able to focus our attention and expertise on technique and locations, thereby making sure that our participants get the right shots. 20% deposit payable immediately and the balance by 1st March. Places: 10 (5: Joe Shutter/ 5: Icelandic Explorer but group is taught cohesively). Social media advice and assistance=. We highly recommend that all participants have separate camera insurance for their gear. We also recommend that this insurance includes the use of a courtesy body and lens. It's unlikely, but potentially fatal. We welcome all levels of photography expertise. What we want to see is that you love photography, hopefully will fall in love with Greenland and want to learn more, push it, take it to the next level, and take in the atmosphere and experience of working with other creatives in an epic context. There will be some hiking once we set foot on shore from the vessel, so you need to be prepared for this, but in general there won't be much hiking on this workshop. If you have one, absolutely! If you don't, consider getting one! Greenland is a fantastic location to drone. Of course, we won't be doing any droning around or above wildlife because we need to be as sensitive to their environment as possible. Non-flying cameras only! Our greatest recommendation in this regard is that you bring a telephoto lens (e.g., at least 300mm or more) this will help you to photograph the arctic wildlife without disturbing them. Canon have a superb 100-400mm which would be invaluable. Nikon also also have a brand new 200-500mm ( which I own and use) and an 80-400mm. Down coat to spend long periods outside and in comfort. Greenland is cold as it is, so you can imagine that it will be colder at sea! North Sailing, our partner for the charter, provide war overalls for the voyage so no need to go crazy with the down insulation. Water bottle, or collapsible bag like a Hydra-Pak. All meals are included on board Schooner Opal, and provided by North Sailing, our partner in this charter. The Greenlandic climate varies considerably, on a season-to-season and year-to-year basis. Having said that, the temperatures will range between from -5 to +5 celcius throughout the day and nights. Wind, snow and precipitation (or some combination of the three) is to be expected in an Greenlandic winter at any time. Silent Arctic, our great adventure yet, has very limited places. booking closes March 15th. fill out the form below and tell us why you would like to join the journey. We get a lot of applications for our workshops: tell us a little bit about yourselves, and why you want to come out with us. Thanks for the request to join Silent Arctic. We will get back to you in the next 24 hours!